Be the first to share your favorite memory, photo or story of Vincent "Skippy". This memorial page is dedicated for family, friends and future generations to celebrate the life of their loved one. 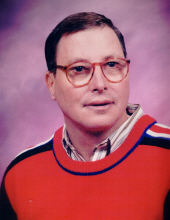 Vincent John "Skippy" Terry, 67, of Staunton, went to be with Jesus on Monday, March 25, 2019. He was born in Baltimore, MD on November 26, 1951, and was a son of Sylvia (Mallison) Rawley, of Mt. Solon and the late Ernest B. Terry. Surviving in addition to his mother is his step-father, Paul W. Rawley of Mt. Solon, three sisters, Billie Jean Daniel and husband, Winfield of Staunton, Christine T. Goodman and husband, John, of Churchville, and Paula R. Wilfong and husband, Dale of Bridgewater; two brothers, Anthony T. Terry and wife, Carolyn of Timberville and Michael W. Terry and wife, Anita, of Spotswood. Numerous nieces and nephews also survive. A funeral service will be held at 11:00 AM on Thursday, March 28, 2019 at Mount Olivet United Brethren In Christ where Skippy was a life-time member. Rev. John Christophel, Pastor Daniel Lam and Rev. Lester Kennedy III officiating. Burial will follow at Mt. Olivet Church Cemetery. Family will receive friends following services. In lieu of flowers, memorial contributions may be made to Mt. Olivet Cemetery Fund c/o Dallas Lam, 87 Barger Lane Mt. Solon, VA 22843. The family would like to extend heartfelt gratitude and appreciation to Billie Jean Daniel and niece, Susan D. Michael for sacrificially overseeing Skippy's care. Additional acknowledgments to The Valley Community Services Board and Skippy's sponsor families that loving touched the life of Skippy and his family through many years of thoughtful care and devotion. To send flowers or a remembrance gift to the family of Vincent "Skippy" John Terry, please visit our Tribute Store. Rev. John Christophel, Pastor Daniel Lam, and Rev. Lester Kennedy, III officiating. Burial to follow in church cemetery. The family will receive friends following the services. "Email Address" would like to share the life celebration of Vincent "Skippy" John Terry. Click on the "link" to go to share a favorite memory or leave a condolence message for the family.